Who could resist the opportunity to see some of tomorrow’s high school stars in their rookie season? 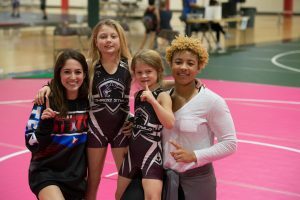 In the opening event of the Houston Nationals Youth tournament, roughly 200 first year wrestlers from kindergarten through middle school participated in the Friday night Rookie tournament. An event like this is a photographer’s dream, with so many priceless and emotional moments. Highlander and Katy collected the most team points – which is hardly of notice in these events. The real joy is watching the youthful energy, enthusiasm, focus and passion as this kids pour everything they have into each match. I truly hope to see them all on the pages of wrestlingtexas.com as they move into the high school ranks. The most thrilling performance of the night might have been in the Rookie D1 50lb class, where Reagan Rayome, of 3 style wrestling, and Cade Knight of Katy Area Wrestling Club had a back and forth battle that went through all three overtime periods before Knight prevailed 7-4 with a last second escape and take down. In Reagan’s cheering section we spotted defending 215lb 5A girls high school champion and #1 ranked Nkechinyere Nwankwo of Richmond Foster High School. Reagan’s father, Jeff Rayome, is the head coach at Foster. Nwankkwo tells us that she is planning to compete at 165lb in the state tournament. With every 5A girls weight class having a returning state champion – Nkechinyere is looking to take someone’s title away. We look forward to seeing her on the floor of the Berry Center next month!